a new career or business! Are you interested in becoming a professional installer in the booming building industry? Do you have a passion to run successful Business? One-on-One training sessions for best learning output. Practical demonstration, Exposure and Involvement in the Installation. We guarantee that you will be fully equipped to start your own successful business or Employ you after the training. There are openings for immediate employment across NIgeria. We are giving out free registration and training to anyone that register this week! 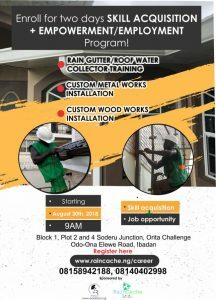 Fill in your information below and choose from: Gutter Installation Training /Roof water collector or Custom Metal Works or Custom Wood Works.